This rug beautifully captures the glory and splendor of Barcelona! The dominant colors are strawberry and cream with a speckle of white, light yellow and green. It is available in oval and rectangular shapes. 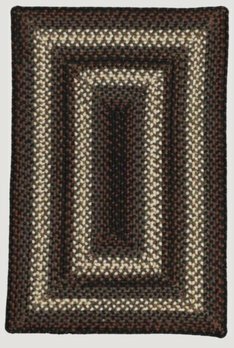 Our Black Forest Braided Rug will make you feel as if you are standing out on a terrace on a starless night! 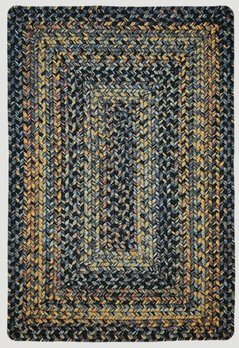 A mix of grays and blacks flecked with mustard, dark blues and brown, a warm and inviting rug. Available in rectangular and oval shapes. 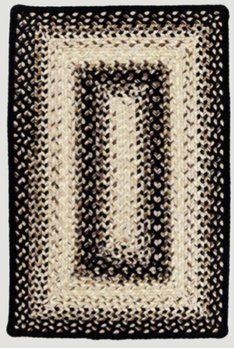 In this rug is a dramatic display of black and cream colors, softened with shades of brown, beige and mustard yellow. Our Ultra Durable Rugs are stain resistant, be it a stain from liquids, pets or food! They also absorb liquids from most modest spills. This is a dramatic rug with a strong black backdrop. 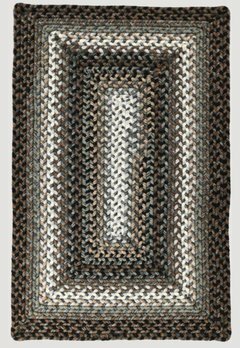 This durable rug intermixes shades of gray to form a bold piece. Available shapes are oval and rectangle. 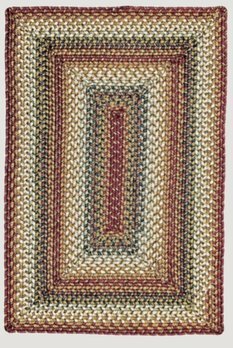 Add this beautiful Canterbury Ultra Wool Rug accented with red, green, navy & cream and warm gold tones to any room! The perfect finishing touch while adding texture, comfort and timeless beauty to your home! We ship coast to coast! 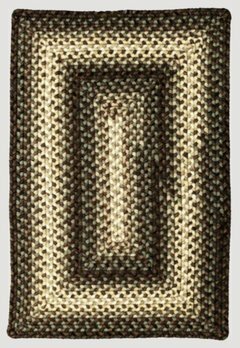 A warm and rich combination of black, brown and olive green, softened with cream and beige makes this a stunning rug; simple yet elegant. Pick your favorite, either rectangular or oval. 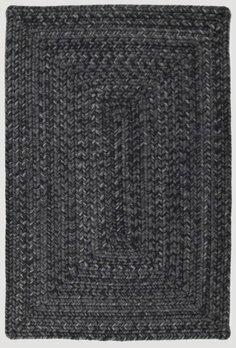 The McKinley Ultra Wool Braided rug is very versatile and will give you the look and soft feel of the finest wool at a very affordable price. 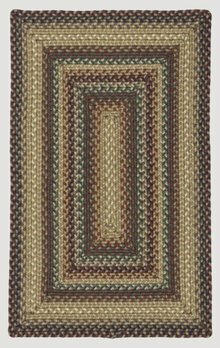 This rug combines shades of black and brown, green, grey and white, with a hint of mustard. Take a look at this rug and you’ll feel you are out on a starry night, with moon light peeking softly from behind the clouds. Black, white and brown with a mix of light orange and subdued green. Available in oval and rectangular. 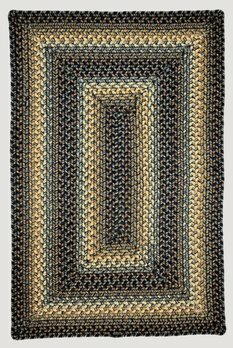 Bold and inviting colors such as black, rust and blue define this rug, softened a little with white. Our Ultra Durable rugs last long without showing wear and tear as well as wick water, are stain resistant, mold & mildew resistant & washable. 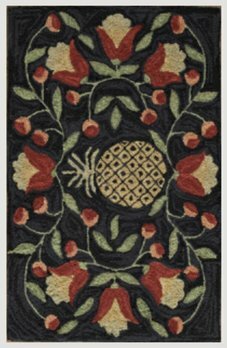 You're going to love this Pineapple Hooked Rug 48 x 72 by Teresa Kogut, rich colors are combined with the welcoming pineapple motif to create a stunning design. 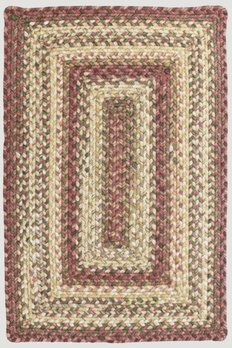 Preston Ultra Wool Recycled Rug with rich, vibrant, colors of red, mustard, green & white flecked with a little turquoise blue! This indoor-outdoor rug gives you the look and soft feel of the finest wool at a very affordable price. And they're washable! 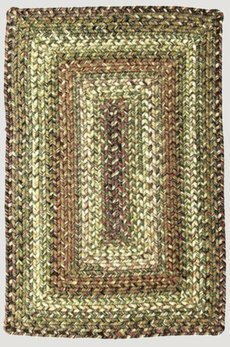 Rightly named the Rainforest Outdoor Braided Rug, you’ll love the warmth & lush green colors. The highlights of this rug are various shades of green, orange & cream along with some yellow, red, white & plum. Also available in rectangle & oval shapes.